While milk prices for 2015 are forecasted to be low, that doesn’t mean that it’s too late for you to do something about protecting your bottom line. Quality milk is always important, but paying special attention to it in lean years will help your business prosper. There are many ways to make sure that things are running smoothly in your parlor. 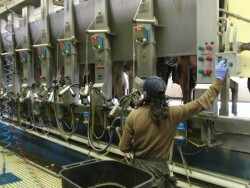 One good idea is to have qualified personnel come in to test your milking system regularly. Incorrect vacuum levels, poor pulsation and milking units that detach too late can all lead to teat-end damage and increased incidence of mastitis. Following a regular schedule to replace inflations, hoses and other rubber parts is also important. While we don’t tend to see spikes in mastitis during the winter months, mastitis problems in spring and summer months are often caused by damage that teats sustain during the cold weather months. Post-dipping is especially important to help prevent mastitis, but making sure that teats are dry when cows exit the parlor on the coldest days of the year (especially those that have to walk outside) will help to prevent chapped or frozen teats. Using a teat dip with added emollients will also keep teats healthier. Prevention will take you a long way, but you will almost surely have some mastitis cases to deal with. When you do, sampling cows correctly, culturing them to find the mastitis-causing pathogen and then providing pathogen-based treatment is key to controlling mastitis on your farm. This will help to reduce repeat cases of clinical mastitis, which can add up to a huge cost. If you haven’t already, you should work with your herd veterinarian to develop treatment protocols for the different mastitis pathogens so that you can make informed treatment decisions. Prepare the cow as you would for milking: predip, wipe and forestrip. Use an alcohol pad to disinfect the teat end, forestrip again, and then fill the milk vial, making sure to hold it at a 45 degree angle with the lid up. Immediately refrigerate if you will be submitting the sample within 24 hours, or freeze if it will be longer. Adhering to all of these guidelines will provide you with a cleaner, more useful sample. One option to help you keep a closer eye on milk quality is to enroll in QMPS’s Bulk Tank Monitoring Program. Participants are entitled to 6 bulk tank milk analyses during a 12 month enrollment period, collected every other month. The samples are conveniently collected through your milk hauler or milk cooperative, and the analyses provide the farm with information on current milk quality and animal health, as well as alert the farm if there are new, recurrent or periodic herd infections. For more information, contact Dr. Paula Ospina at pav@cornell.edu or 607-253-3933.